The classics come to the Netherlands and huge crowds enjoy a day in the sun and beer from the race sponsor. The hilly course has been for the climbers but several sprinters want to muscle in and a new finish is designed to stir up the action. Sunday’s race offers the rare chance of seeing the likes of Greg Van Avermaet and Alejandro Valverde, the season’s most succesful riders, go up against each other. Here’s a race preview with the usual look at the course, contenders, TV times and more. The Route: 259.7km and apparently more than 4,000m of vertical gain, impressive for a day’s racing in the Netherlands. It’s all packed into a narrow area and having the route loaded on a GPS device can help racers know which way to turn as the race twists and turns across the Limburg province, as well as a brief visit into Belgium. In total there are 35 climbs, albeit with some counted two or even three times and others would barely register as a 4th category climb in the Tour de France. Few of climbs are hard, typically a gradient of 5% for a kilometre although a few do have double-digit slopes and the Keutenberg, the nation’s steepest road, maxes at 22% and comes with 29km to go. If one hill climb is fine, 35 hill reps hurt. The vertical gain adds up but it’s the fight to be at the front that really takes its toll, these are narrow climbs that string out the field. Anyone badly placed will waste energy trying to get back up and so they’ll start the next climb in a worse way and so begins the vicious cycle that ruins their chances. All this is made harder by a course packed with street furniture and traffic calming measures to enrage straggling racers. The Finish: this is the novelty for 2017 but it’s not that new or different. You’ll remember the previous course tackled the Bemelerberg (1.3km at 3%, a brief moment at 6%) and then after a flat section dropped into Valkenburg and taking the sharp corner to start the Cauberg climb (1500m long and 4.7% but with steeper earlier sections maxing at 12) and then 1.8km along a false flat to the finish. Now the race scales the Bemelerberg, drops a little and then takes a left at the top towards Vilt, avoiding the descent into Valkenburg and the climb of the Cauberg. The new road is ordinary and slightly downhill before it joins the old finishing straight with 900 metres to go. The Scenario: a bunch sprint or a breakaway? The change to the finish is designed to prompt the climbers and attackers to take their chances earlier in the race rather than sit tight all day for the Cauberg. Subtract the Cauberg though and you have a less selective finish that lends itself to a bunch sprint of the surviving riders, say 50 or so riders. As ever it’s the riders who make the race but on these roads its hard for a team to control matters. Michael Matthews is the safe pick for his ability to get over the climbs and win the sprint from the surviving group. He was last year too but the revised finish suits him even more only this simply means everyone else knows it and has an interest in splitting the race up. Matthews is in good form having won the opening stage of the Tour of the Basque Country and if his Sunweb team flies under a German flag they’re long on Dutch heritage and staff so this is almost their home race. Simon Geschke, Wilco Kelderman and Warren Barguil provide more options. 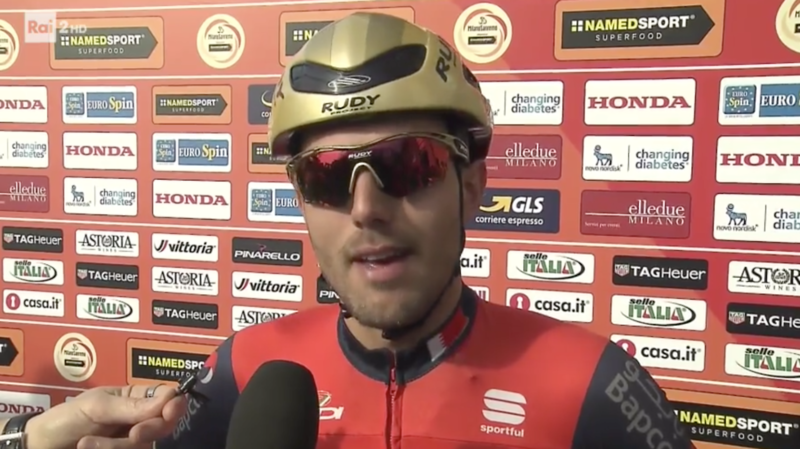 Sonny Colbrelli made the podium last year and returns in great shape having just won the Brabantse Pijl making the sprint look easy and after working hard to propel the breakaway. He can’t win dragstrip sprints but this course will eliminate rivals. Enrico Gasparotto has won twice before but in the absence of the Cauberg but surely Colbrelli is the team’s pick right now. Who’d bet against Greg Van Avermaet? One of the doubts about his Paris-Roubaix win was whether he could keep the form that he showed in the Omloop all the way into mid-April but that’s been addressed by now. He’s versatile and transformed from nearly-man into surgical finisseur who seems unshakeable when sprinting from a small group. The mooted bunch sprint won’t be for him so look for a late move. Alejandro Valverde is another rider with an aura of invincibility this year. However he seems more suited to upcoming races than this one, even with his great form he won’t win a bunch sprint and if he makes it into a winning breakaway he’ll still find competition from fast finishers and the move away from the Cauberg won’t help. Michał Kwiatkowski is back in action for Team Sky and a previous winner of this race when he threaded his way through the bunch to win the sprint. The lack of the Cauberg means purer sprinters and finishers won’t be so asphyxiated so Kwiatkowski’s chances of a win look slimmer unless he takes a flyer early and gets in a selective more. Philippe Gilbert leads a Quick Step team so strong you wonder who will be fetching the bottles (answer: neo-pro Max Schachmann). Once upon a time he was invincible on the Cauberg but perhaps age has dimmed his uphill jump so the change in the finish is no bad thing. Gianluca Brambilla should be coming into form for the Giro, Petr Vakoč looked good in the Brabantse Pijl, Zdeněk Štybar is in great shape after his podium in Roubaix but has had his best results on hilly roads while Dan Martin, Bob Jungels and Dries Devenyns bring more but they’ll still miss the injured Julian Alaphilippe. Nathan Haas is a good outsider for reduced sprint finishes. He’s long shown his talent but that’s been part of the problem, a tendency to show too early in a race rather than pop up in the final ten seconds to snipe the win. He’s better at this now only the subtraction of the Cauberg doesn’t help. Orica-Scott have some options for a sprint in Simon Gerrans and Michael Albasini but their problem is the competition. Gerrans could sneak away in a move, Albasini could hope for a sprint from a reduced group but either way they’ll have rivals. Gerrans used to be ideal for this kind of race but he’s 36 now and aside from the Tour Down Under this year – a welcome return but a parenthesis – he wasn’t won anything since 2014. “Alba” is still winning but an outsider all the same. Lotto-Soudal have an exciting squad with the likes of Tim Wellens and Tiesj Benoot forming a redoubtable attacking pair to the delight of TV producers fearing a procession and a bunch sprint. But attacking is one thing, winning another and for all the excitement it’s hard to see a win. Tosh Van Der Sande and Sean de Bie add more fireworks. Bryan Coquard is made for a race like this and has been winning plenty of races this year but he’s yet to win a World Tour race. On his day he can rival Marcel Kittel in a speed contest and because he weighs less than 60kg he can scale the hills. But the lack of wins means a lack of assurance and he and his team can waste energy, we saw this in the Brabantse Pijl where Direct Energie did plenty of work only for Coquard to launch his own attack disrupt what was left of the chase. Lilian Calemejane is one to watch, successful in lower tier races but now hunting for World Tour glory. Finally the quick run of others. Lotto-Jumbo race at home but it’s hard to see a win, they’ll hope for a podium with Paul Martens. UAE-Emirate’s Ben Swift is similar to Bryan Coquard, each former track riders and lighter sprinters. Only Swift is far less prolific but tends to place on the podium in big races. Trek-Segafredo’s Fabio Felline had a horror crash a year ago when he somehow put his hand in his front wheel, his hand met the fork and he cartwheeled over the front of his bike to fracture his skull so it’d be poetic if he could win and he’s an outsider, able on hilly courses but the distance could toll today. Michael Valgren made the podium last year and has plenty of talent but how to win, he’s not shown the sprint needed. Bora-Hansgrohe rest Peter Sagan in arguably the most obvious race for his skillset leaving Patrick Konrad and Jay McCarthy as stealth picks. FDJ’s Arthur Vichot has been knocking on the door of a big win in a hilly race for some time but he’s taken a few knocks of late, getting beaten in races when if he want to win the Amstel he’d need to have won by a long way. Lastly Wanty-Groupe Gobert won a year ago and their hopes rest on Xandro Meurisse who packs a fast finish. Weather: cool and cloudy with the chance of rain. A top temperature of 11°C. Crucially there will be a 20km/h wind from the west, nothing to ravage the peloton but enough to ensure a head/tail/crosswind along the course including a headwind for the finishing straight. History: first run in 1966 to promote Amstel Gold beer, this is the 52st edition of the race – spare the Rebellin jokes – and yet this is still seen as a modern race, a newbie classic that has only recently grown in stature and prestige. In years past it came the weekend after Liège-Bastogne-Liège, a last chance beer-drinking saloon for classics riders trying to salvage the early season but since then it has moved, joined the World Tour and is a fine event in its own right. Home rider Jan Raas has the most wins with five with Philippe Gilbert on three, ahead of Eddy Merckx, Gerrie Knetemann, Rolf Järman and Enrico Gasparotto with two. TV: the race starts at 10.20 CET in, local channel NOS starts their coverage at 1.10pm Euro time with Eurosport picking up at 3.00pm and the finish is forecast for 4.55pm CET. Tune in early to watch the riders get eliminated by the climbs (and sadly the crashes) but the bulk of the action tends to come late in the race so unlike last Sunday’s Paris-Roubaix you don’t need to set aside your Sunday for this one. If you can’t find it on TV, see cyclingfans.com and steephill.tv for streams. 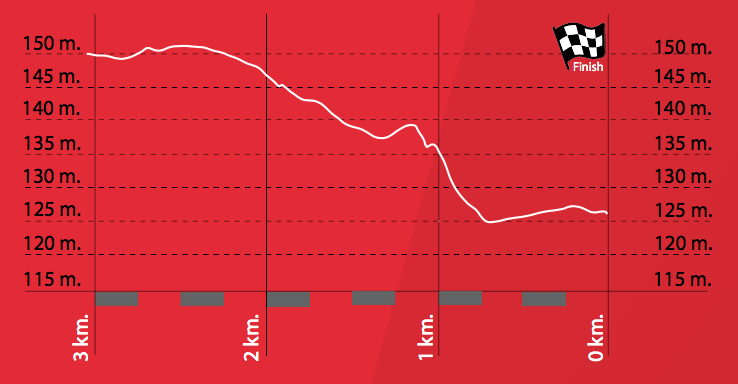 Women’s race: there’s a women’s race on too for the first time with the finish forecast for 2.15pm CET. It’s partly on TV with Dutch channel NOS covering it. I wish it was on Saturday and plan to explain more in the blog post next week. There is a hugely popular mass participation event run on Saturday this year. Interested in your thoughts as this is similar to the timetable of the Ronde/Tour of Flanders. Always good to see people enjoying the roads and the route. I suppose for many Dutch riders the combination of the pro race and the hillier Limburg region makes for a big attraction. Great post (is it proofread, though?). Michael Matthews turns into Michael Rogers, and Lillian Calmejane is rather rethoric? Crosswinds would be great – but surely it turns too much this race? – looking at Felline and Kelderman(if allowed up the road), possibly McCarthy as outside favs. Felline and McCarthy looks at form lately especially. Hoping for an outsider, and no bunch. Please ride according to Faith no More. Sorry, hit the publish button on the phone before proofreading… after a long day standing on top of a rickety roof fitting a satellite dish and cabling in order to better watch this race and Monday’s Tro Bro Leon. Matthews and Calmejane get their due mentions. Which FNM song: ‘Easy’? Someone ‘From out of nowhere’? Gerrans to get over his ‘Midlife Crisis’? ‘A Small Victory’ or a ‘Last Cup of Sorrow’? Great to find this preview up on a Saturday evening. I’m hoping it will follow the trend of the spring and see some favourites attack from afar. If a small group of those riders get up the road it will be difficult to control. Matthews has shown incredible form of late, apart from the win there was a close second after a climb in Pais Vasco, the TT result was impressive over 25km with the climb at the start too. Maybe he even has the climbing form to follow an early move rather than sit tight, given how things have panned out over the last few weeks rewarding the early attackers? Of course the repetition of climbing is a different matter and we’re (hopefully) talking about the likes of GVA, Gilbert and Valverde on the attack. It will be interesting to see how teams play things and how it plays out – attack, attack, attack would be lovely for Easter Sunday! When you look at the Amstel Gold results before they added the Cauberg finish a bunch sprint is far from nailed on. It often came down to a small group of attackers that always seemed to include Michael Boogerd and Lance Armstrong. In amongst it though there are the likes of Zabel, Zanini and Musseuw. My prediction is a small group including the riders that have been doing well over the last few weeks – so GVA, Gilbert, Naesen, van Baarle, maybe Stybar – and maybe also Matthews, Colbrelli and ‘Le Coq’ as well. Should be a good and interesting race. Oh and Valverde obviously as well! Interesting, the route has changed but can we see this as a return to the older days of the race? I wonder if there are still too many hills for the likes of van Baarle or Naesen? Since you mention van Baarle Cannondale have an interesting squad, no stars but several strong riders. van Baarle is interesting, if Naesen climbing form is better than in E3 then he’s for sure strong enough to get back from the climbs (his Ruobaix form was very impressive, void of mishaps), but needs a small group or even solo effort to win this. Only if riders need to b-e agg-r-e-ssive for these two to do something, but then surely Wellens will go ahead, especially in sheit weather? Small chance of some rain I see, breeze forecast..
Would love anyone like them to win, anyone but the usual suspects! Lance has small chances tomorrow. I missed off the other obvious big favourite too, Kwiatkowski! I was thinking of van Baarle in my mind as quite a small light rider but Wikipedia has him at 6’2 and 78kg so maybe not! Possibly the worst podium girl outfits in pro cycling! I can think of better uses for beer mats… It will be interesting to see the new finish, especially if the breeze is up from the West as the run in is exposed. It would make it hard for a lone rider to stay away unless they have a decent margin off the Bemelerberg. Matthews looks good for this. That’s one tradition/anachronism I’d happily see dispensed with. Would be even better to follow the growing Aussie trend, and have Junior’s there to get the chance to meet pros and generate more connection with grassroots cycling. Good tip on the wind thanks. However, all the classics to-date have been raced incredibly aggressively. People like Kwiat, GVA, Gilbert will be trying to bust this race open early. It will take a lot of strength and form for a sprinter type to hold on. Gerrans won the Tour Down Under in 2016 actually, but yes, age and a series of crashes meant he’s never got close to the form he had in 2014. Why rest Sagan? For what? When’s his next big race after today – July? Especially considering that he hasn’t won any big races this season. This seems a decision right up there with him not doing the Olympics. I’m hoping the new course will make for a more interesting race. The final pound up the Cauberg was exciting, but the 250km beforehand often weren’t. Inexplicable decision. His next target is probably Tour of Cali but I can’t see how winning one or two bunch sprints in this race can be a target for a rider of Sagan’s pedigree. It’s probably down to sponsor’s (Specialized) expectations to show up in America. I am afraid that Sagan is very badly managed. It starts with how his team is build around him (friends and compatriots but no-one who can be of any help when the racing heats up) and ends with decisions like skipping Amstel Gold. If nothing changes in this matter, he is in danger of becoming a nearly man. Given his pure talent and strength his palmares should have one more monument at least and countless other races, where he came second or third due to poor tactical decisions and lack of support at crucial times. Isn’t it more a case of Sagan having aimed to peak for Flanders and P-R and needing some rest after that peak, before rebuilding towards July? He’s been there or thereabouts since MSR, after all. I don’t buy that argument. 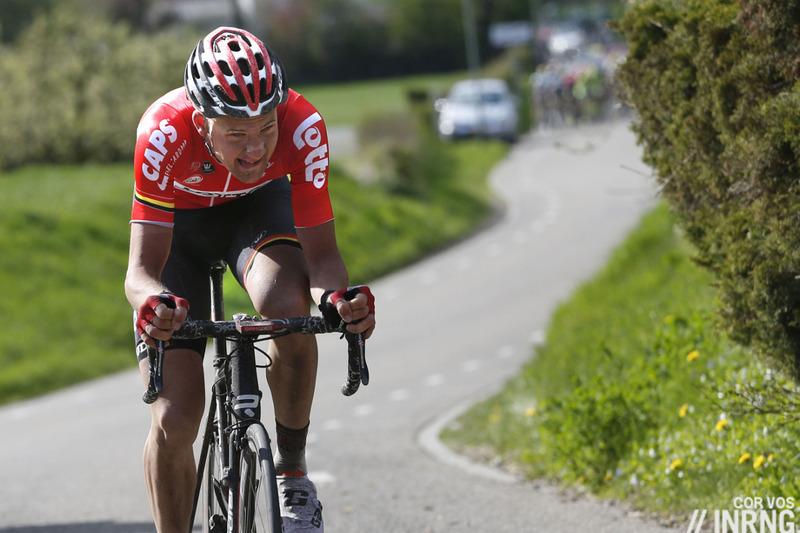 Gilbert is also going strong since end of February as is Van Avermaet. Keeping the momentum going for one more week wouldn’t have made any difference. I think it is more of a case of poor management and lack of leadership at Bora. In my opinion for Sagan to fulfil his potential he needs a DS with strong charisma, experience and tactical nous. As much as I like Bora, I don’t think that it’s the right environment for him as I see it like something of a big fish in a small pond. +1 like the Olympics last year – Sagan should have been there today. Just so long as the checks are still cashed! Nick has got a very good point, although I personally don’t like the whole *peaking* thing, but it’s not like athletes are prepared like that because professional trainers are a bunch of fools. What might sometimes happen is that trainers work with general protocols and received ideas which maybe don’t work with some *very specific* riders – the good trainer (or athlete himself or herself) is the one who gets the perfect tailor-made program for the individual physiology, and that may mean something different from most of the bunch. However, this season it’s more about GVA having a very very very special year rather than the other way around. Gilbert himself started to show some prowess in March – when he was far from the level he reached later, anyway, unable to match Alaphilippe and Démare’s climbing punch in Pa-Ni. He started to impress a couple of weeks later, to say the least: not comparable at all with GVA’s winning streak (but we may apply what I comment below about Gilbert’s 2011 season, even if GVA’s case he even more extreme). Just have a look to the performances of many multiskilled Classics rider when they were tackling the Ardennes after a strong pavé campaign (and the Het Volk’s curse depends on the troubles everybody’s got to bring form from February to Roubaix, not to speak of mid-April). Let’s speak of… GVA himself? Nothing relevant until 2010 included. In 2011 he could make a top-ten at Liège, but he had skipped Roubaix and never made a top-ten on the cobbles, despite riding most of those races. In 2012 he looked for earlier form showing himself up as soon as Het Volk, then peaked for Ronde and Brabantse (no Roubaix once again) but was increasingly disappointing through the Ardennes. Same goes for 2013, when he added the Roubaix: note that despite being stronger than the previous year, the early results (Het Volk, Strade Bianche) were similar, hinting at a delayed form growth. 2014 went the other way, in order to maximise Ronde’s chances: it was a second place (just as in the Het Volk in February), but that implied that the Ardennes campaign had to stop at Amstel and the Roubaix was slightly under par, too. 2015 is the last reference year, due to 2016’s accidents, and GVA started a strong build up in March (a step back at the Het Volk), then performing strongly all the way from Ronde to Amstel, via Roubaix (after taking a breath in E3). Once again, the Ardennes didn’t go further than Amstel. Even in the case of a rider like Gilbert, with a well proven attitude for keeping a strong form through many weeks, it can be noticed the difference between season where he looked for earlier rather than later form (2008 a fine example of the former, 2009 of the latter). In 2011 he was winning quite soon, but that was also because that year he was so much stronger than the rest that he could win without being at his very best. Actually, Gilbert was a level below Sagan in Feb/early March, which indicates a later build up. But equally, as Gabriele says, different riders might hold their peaks for different lengths of time. I suspect we won’t see Sagan focus on the Ardennes week until he’s won MSR, as it seems unlikely to me that anybody could win both Monuments in the same season nowadays. Even in the past only de Bruyne and Merckx have ever done it. Is Sagan managed at all? I get the impression he does what he wants. Mindless he wasn’t at Amstel Gold. He’s very managed. He’s probably got a bigger entourage around him than anyone else in the sport with an Italian marketing agency handling his endorsements and social media etc. That’s two down the hatch, what a star!! (no spoiler). I find it hard to believe that Valverde didn’t have the legs to go with Kwiatkowski when he bridged. GVA has – finally – learned that those get you a lot of 3rds. Rojas, evidently, has learned from the master. Nathan Haas still hasn’t learned how to work with other riders – did he really think he would catch Kwi and Gil on his own? Couldn’t believe it when Gil took the front with a km to go and assumed that Kwi would beat him no matter what. That, however – after all Kwi said about his thinking in the M-SR sprint against Sagan (when Sagan went too soon) – was one of the worst sprints I’ve ever seen. He went with 300m to go into a headwind, up a hill. I actually laughed in disbelief. And the new course is a definite hit – now, hopefully, LBL will follow suit as so many of us have hoped for so long. +1 I was stunned with Valverde at that moment. Rojas must have been out on his feet by the end, but still considering his lack of work, that was surprising. I think chill on Haas, they were all dead, it was a case of the strongest two riding away, cohesion for the remnants of a break in that situation is hard to come by. He deserves praise for even being there. Agreed on Gil on the front, very surprising to start with – but he completely out psyched Kwiat, counter intuitive tactics – very impressive – just a brilliant race. Valverde’s flaws continue to vex me. 99% of the time he looks imperious, and his confidence and racing style appears to have become emboldened in recent years. Yet something always goes missing inside of him during the very biggest moments, be it a major one day race or Grand Tour. It’s hard to pinpoint the cause, although I suspect it’s primarily mental. Agree with your analysis of the sprint, Kwiato launches too early in headwinds, plus a long sprint is in Gilbet’s advantage. He caught 5 meters but that was not enough against such a rider. Dislike Valverde, but he’s won a hell a lot however dislikable his style, so can’t really criticise. Especially can’t use the above to level against him in terms of Grand Tours, partly because he has won one, and it’s more of a beat fair and square in those scenarios – rather than sandbagging and crippling a counter attack as he seems to often do in one days. I don’t think Valverde had the legs yesterday. Kwait noted that him and GvA were both struggling so he went for it. GvA’s rough day might negate earlier arguments about Sagan racing Amstel. And GVA has no lingering ‘What if’s. Both true. Perhaps not rough but he was struggling somewhat; I think Sagan might have struggled more seeing how cooked he looked at the end of P-R. 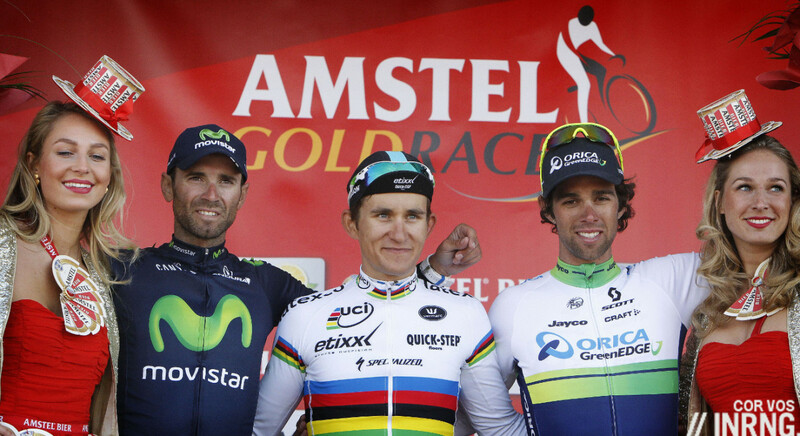 This was the most exciting edition of Amstel Gold Race I have seen since years. Or to put it differently: If they decide to go on with this course- would the race become static ats some point again? Is it the change that makes a team ride a race tactically in a more flexible way? Or should they just put the Muur of Huy 10 km before the finish to make fleche exciting too? I wonder also whether this is first year magic and whether once teams understand it, could it start to become more predictable? I thought this with Flanders this year, I think Sagan and GVA would have caught Gilbert, and in that case the 100km break wouldn’t have worked out, would this have deterred people from doing similar in 2017? Whereas now, I expect people will try it next year and maybe fail, meaning we’ll be back to the big wait for the final two climbs before long? Will Amstel soon develop into a sprint finish? But it was great agreed. I was wondering the same too. The new course worked but was it the route or the riders? One example from the past was Liège–Bastogne–Liège in 2013 when roadworks meant a course change a few years ago, out went one or two of the more famous climbs and in came some lesser ones but arguably the racing was better. One reason was because the usual script had been torn up, riders had to be on guard so they rushed to the front and in a self-fulfilling way the race began early. I think it will have to be the way the race is ridden in future. If it isn’t you’ll tow a Matthews or Colbrelli to the line and they’ll win. I think it might not be from so far out, that just seems to be Gilbert’s way this year, but the last 3 climbs might become a set piece in the same way as the last 2 are at Flanders. This is really interesting thank you. Maybe the answer is to have constantly rotating routes? How much extra cost would that incur? I think the new route definitely helps getting more dramatic racing, but if a strong team decides to pull for a quick guy, we can also perfectly have a sprint of a reduced bunch. It is up to the riders. For sure the ones of Phil Gil, GvA, Sagan also help getting these interesting scenarii. ANother item that helped yesterday is the wind. On the top of those hills there is always a false flat section, if the wind is not favourable it helps making small gaps created on the hills bigger. If i had one comment on the new route is that I wold skip one of the two last climbs (they are not really steep) in order to make the eyserbosweg/Keutenberg part closer to the finish as well as the Cauberg. Great race! Phil Gil shoud be the favorite on la fleche beside valverde. With his form, no way valverde can beat him in a one two sprint. I don’t know if it’s me, but i see Gilbert a lot smoother riding he’s new specialized vs the old bmc! This is hard to say – I think Gilbert has lost a little in his sprint and Kwait miss timed today into a headwind slightly hiding Gilbert’s lack of top speed against the best ‘sprinters after long distance’ (ie GVA, Matthews etc) – whether he could take Valverde is hard to say? Actually I’d love to know what the speed differential is between top tier sprinters (Cav, Kittel), the classics sprinters (GVA, Sagan) and those who climb and sprint (Valverde) – how would Valverde fair against Cav in a straight sprint? Is Valverde faster than GVA? Cause I’d expect any of Cav, Kittel, GVA, Degenklob to have Gilbert these days but unsure whether that includes Valverde? THE BIG QUESTION – HOW FAST IS VALVERDE? The muy is about positioning and that last burst of power and speed. Phil Gil is seating now in the Captain’s chair! Valverde isn’t able to keep up with the cavs/kittel s or even the second string pure sprinters in a flat sprint. Matthews was very disappointing today. Rather his team was. If you have the fastest guy you’ve got to get him to the finish line, Sunweb should have been on the front as the break was caught to shut down the sort of move that got away and use numbers to keep the pace up and ensure a sprint finish. Instead they were MIA. Kwait only had Golas, Henao from 70km mark and managed to be involved, Matthews should’ve taken things into his own hands far earlier, he still had four members of his team at the Cauberg even though they were a min down by then, but it’s more than almost anyone of the other protagonists had from the 60km mark – even if BMC were only down because of early pacesetting – he must have not had the form not to go with GVA at least in the response to Gilbert – because missing the first move is understandable, but the second also is just poor if he had the legs. Matthews “won” the bunch kick which was actually competitive, so I think the legs were there, just too bad his team were out of position in the critical moments. BMC were doing early pacesetting, but where were Sunweb when it counted? Then the winning movie had so many teams’ top riders involved there was no energy in the chase, and anyway since Matthews was the favourite going in I’m sure the other riders were aware of where he and his team were at all day. “Matthews ‘won’ the bunch kick”. Didn’t Colbrelli win that? (sincere question, I haven’t seen the race yet). Some classic Movistar tactics in evidence today. Valverde wouldn’t pull to close the gap on the lead group or to follow Kwiato when he bridged. And Rojas tried the whole I’m waiting for my teammate thing. Deserved nothing got nothing. Gilbert and Kwiatkowski, and GVA although he was unsuccessful, showed how to ride one day races properly. We are seeing some really top class riders (those 3 plus Sagan) really on their game this year and it’s a great watch. Will he repeat his 2011 treble? The way he’s been racing and his form, he certainly can! No he’s out. Apparently he damaged his kidney in the crash he had yesterday. Kwiato you dummy. If you had any patience at all you would have won. Your initial burst of pace was more than anything Gilbert had left. If you’d have unleashed it at the right time you win! Here’s hoping you get it right at LBL. Harsh, he made a mistake… so is life no? Kwiato usually on point in those scenarios, he’s allowed one error. Plus credit Gilbert for out psyching. I thought he was a canny finisher, but not yesterday! He knew it too, with that look over the shoulder with 75m to go. Looking at the profile above I wonder if he tried to use the slight dip at 250m to get a flyer. Up against the wrong rider for that. Almost look like he mis-judged the distance to the line. 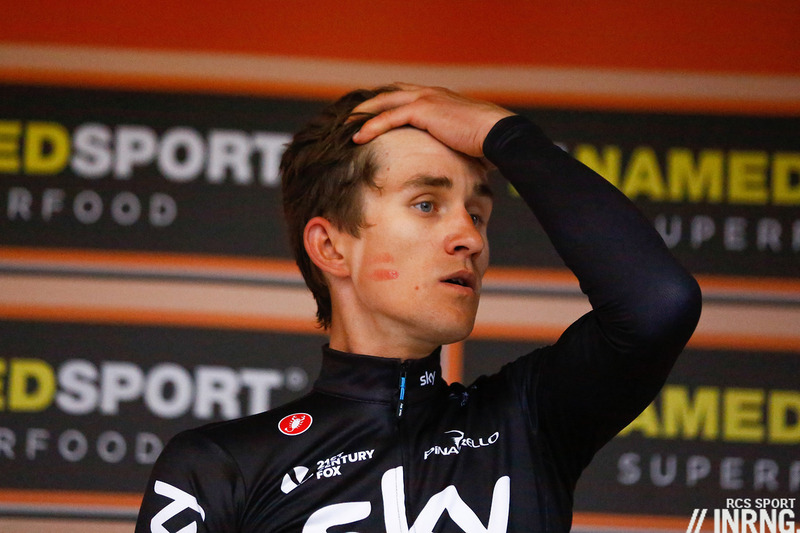 He did take Gilbert aback when he jumped but then Phil quickly realised that Kwiato jumped too early and didn’t panic. Maybe Kwiato should have done a recon of the finish or at least look at google map street view first (though there’s some terrible distortion of distance in street view)? That was the best race of the season so far no? Between that a Flanders?